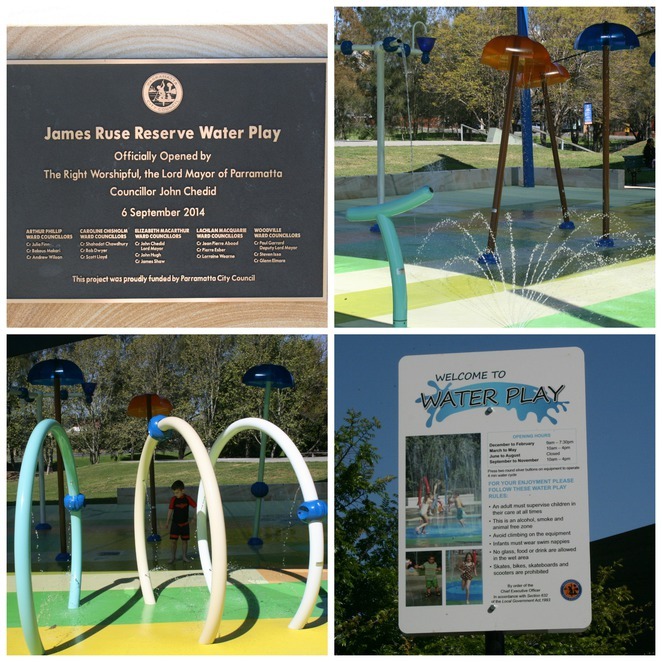 Just in time for summer, Parramatta Council has built an awesome water play park at James Ruse Reserve on the border of Parramatta and Harris Park. It does get a bit hot out in the western suburbs during the summer months, so residents now have a space to go to cool off that won't cost them a cent (actually, that's not quite true, they may have to cough up a few bucks for the parking meter). The park has just been opened (at the beginning of September), so it has a brand spanking new feel to it. The water play area is covered by shade sails and there are areas suitable for both little and big kids (and of course adults if we need to cool off as well). The water is turned on from 10am - 4pm during Spring and Autumn and from 9am - 7.30pm during Summer. In the Winter months the water is turned off completely, but you can still play in the playground. The playground also has non water equipment such as a massive rope climbing frame with a rope bridge, slippery slides, climbing mounds, swings, and ride on roosters! There is also loads of green space where you can kick a ball, fly a kite or ride your bike. If you have a little skater kid in your life they are bound to love one of the 2 skate parks that are also on site at the James Ruse Reserve. The whole reserve has been beautifully landscaped to give it a farm like feel. At the entrance a Farmer rests his arm on a pole on one side and on the other is a kookaburra ready to break into full song. Behind them on the opposite side of the park are metal sculptures of corn stalks that have been made to look as those they have been planted in the pine bark and nearby is a random metal pig sculpture. The farming theme has come about because of the history of the Reserve - it was once part of the land grant given to the former convict James Ruse in 1789, who was one of Sydney's very first farmers. The Reserve occupies land that once belonged to his "Experiment Farm" and the original cottage is visible on the other side of the road from the Reserve. On a hot western Sydney's day the metal slippery slides may be a tad too hot to slide down and the same goes for the pig if anyone decides they want a piggy back ride! I suppose at least there is some water close by if any burns need to be soothed quickly. 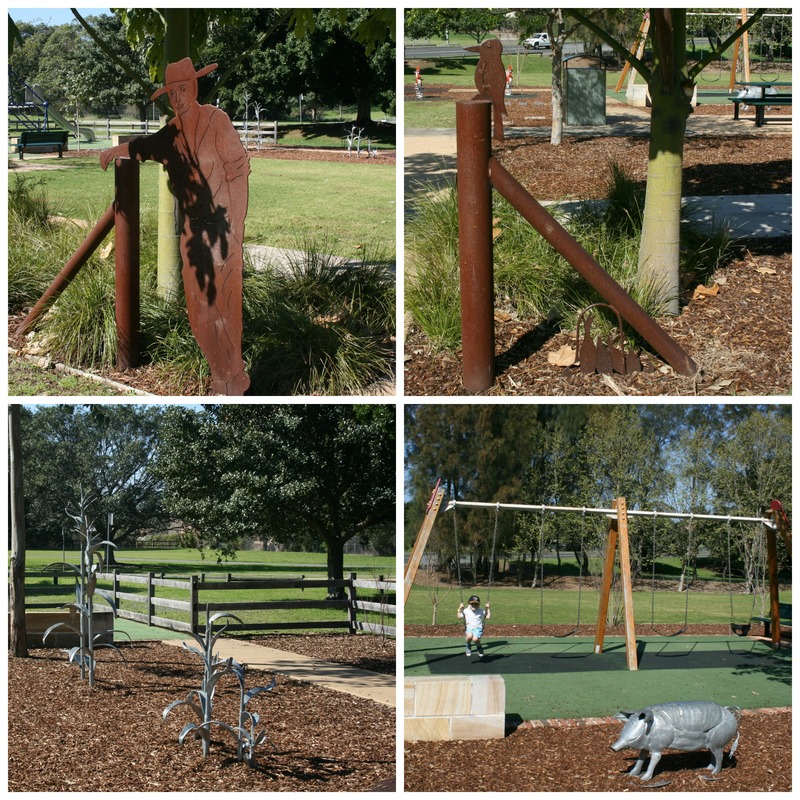 There are some covered picnic tables and lots of beautiful shady trees where you can throw down a blanket and have a picnic, otherwise most of the tables and seats located throughout the playground are uncovered to remember to Slip Slop Slap. The only problem I found with the new playground was that someone forgot to build the toilet block! Children always need to go to the toilet at the most inconvenient times when you are out and about. Add some water into the mix and the likelihood of them needing to go will be doubled (so maybe don't picnic too close to the shady trees, if you know what I mean!). I've been going a lot since it open but it dose need toilets and a BBQ area and then this place would b complete. This is a great place so our community can reach out to one another . Al most all childrens parks there's no toilets, its soo shame, so what is the use of the park? Even in play grounds. If there is any toilet that is locked or dirty . So very often we are going to the kids , I humbly requesting to the authorities to make some toilets in parks, play grounds and public places. That will be very greatful .